Think teachers are overpaid? Think that schools are properly funded? Wait til you see this infographic. Teachers are increasingly spending their own money to provide school supplies to their students, according to a recently released survey. According to the survey from insurance firm Horace Mann, 56 percent of teachers said they spent at least $200 of their own money on school supplies, and 13 percent said they spent $600 or more. 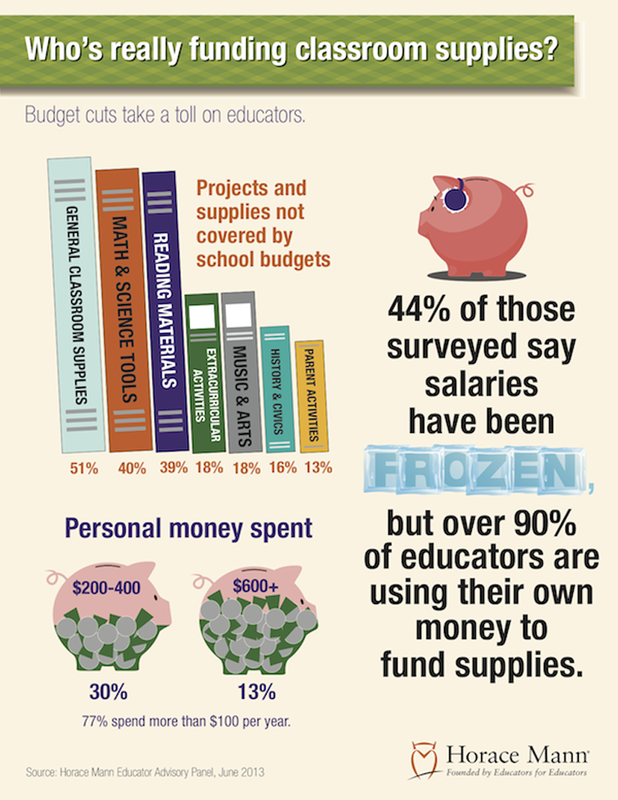 The survey also showed that 53 percent of teachers said their school districts cut budgets for school supplies. General school supplies, such as paper and pens, were the most common items cut from budgets, followed by math and science supplies, and reading and language supplies. The survey also showed that 38 percent of teachers reported that they abandoned more than two projects over the course of the school year because of lack of funds. This is one reason I’m a big supporter of DonorsChoose.org. You can view my DonorsChoose page or jump out there and find one that you want to donate to yourself.